Avoiding accident and tragedy can be as simple as installing a pool safety pence, which offers numerous other benefits to pool owners. A backyard pool is a great feature for any yard. It can turn any backyard into a true summer destination that provides a place to relax and brings family and friends together. However, it is no secret that owning your own pool is not all fun and games and can even pose a safety hazard. In fact, according to the Center for Disease Control and Prevention (CDC), Drowning is the second leading cause of death for children under the age of 14. Avoiding accident and tragedy can be as simple as installing a pool safety pence, which offers numerous other benefits to pool owners. 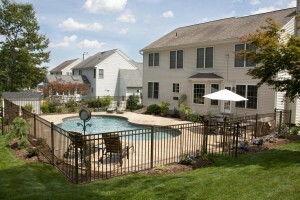 If you entertain large parties or have young children of your own, a pool safety fence is key. It will prevent rambunctious kids or clumsy and unaware younger kids from accidentally stumbling into the pool. It will also provide peace of mind your party guests, and prevent them from getting into any trouble should they wander by your pool unsupervised. While pools are a lot of fun, it is always important to be responsible. If your pool is not open, broken, has chemical problems, or is empty, having a pool fence to prevent people from tampering with it is incredibly important. Often people do not pay attention, or can make problems worse unintentionally. Falling into an empty pool can cause serious injury. If your pool is undergoing maintenance or closed for the season, a pool safety fence is a great way to keep people out. They protect both your loved ones and friends, and your property. It is not uncommon for rambunctious neighborhood kids to make a game of breaking into pools in their neighborhood for laughs. They are often reckless, can do damage to your property, and can possibly even get hurt sneaking into your pool unsupervised. A pool fence will deter them from possibly getting hurt on your property or doing any damage. Need a pool safety fence? Mid Atlantic Deck & Fence is here to help!